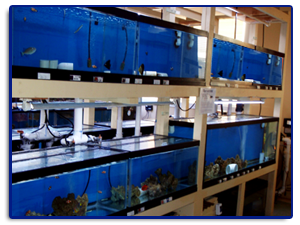 Coral System is comprised of a 260 gallon, semi hex look down tank and a wall of 30 and 50-gallon breeder tanks. Controlled by Neptune Systems Aqua Controller III. Giesemann T5 lighting, mostly sets of 4 – T5 bulbs over each tank. 2 - 50-gallon tanks have 250w metal halide radium bulbs. JBJ A.T.O. tops off the system, Sequence hammerhead is the driving force, Tunze power heads and EcoTech MP-40 Vortechs can be found in various tanks for increased flow. Filtration is all in-sump. Bubble king 300 doing the skimming and a Deltec kalkstirrer stirring and dosing kalkwasser. We stock multiple types of coral ranging from zoanthids and leather corals, to acropora and chalices, and everything in-between! frag prices start at $5.00!!! Our Fish System has 14, 40 gallon breeder tanks and a 125 gal. tank. Ample room for just about any fish you can think of, to be displayed before going home with you. At a salinity of 1.018 - 1.020, parasites have a difficult time surviving, helping our fish to be healthier and cleaner than most store bought fish. This almost always ensures a fish will live a long, happy life in your home setting. This system is being filtered by an RK2 commercial protein skimmer, Zapped (uv sterilization) by an Aqua sterilizer, aerated by an Alita Al 60, driven by a Sequence Hammerhead, topped off by a JBJ A.T.O., and the temperature is controlled by a Ranco Temp Controller. Healthy fish are our top priority! The invertebrate section of our store houses many types of snails, 3 or 4 types of hermit crabs, and various different nudibranchs, crabs, and shrimp that eat many different kinds of algae and parasites. This is also where most of our nano-reef fish are housed. That ensures the smaller fish get their time in the spotlight, showing you that they don’t need to be big or swim really fast to get recognition! Many specialty clownfish including Picassos, Black Ice, Midnights, forzen frost bites, golden nuggets, and many more. T5 ready fit kits light this system with Giesemann bulbs. Filtered with a large sump and skimmed with a Bubble King Mini. This system is also topped off with a JBJ A.T.O. auto top off unit. Last but not least, this system is monitored by a Neptune systems aqua-controller III. We carry primarily Fiji live rock, very porous and lightweight. Our stock varies but our usual type of rocks are Fiji Slab (shelf), Branch, Totoka, and Pukani. Our 300 gal. main display tank is aquascaped with this premium rock. No epoxy or added supporting structures were necessary in aquascaping. All rocks fit together like a giant jigsaw puzzle! The main display is a 300-gallon tank positioned opposite the front doors so it can be the 1st thing you see upon entering our shop. It displays various different types of fish specimen and corals that can be fragged or sold for your home aquarium should you like them. Aquascaped with live rock that we carry, the display tank will give you many ideas about how you may want to model (or remodel) your reef. Filtered sump style, with a Deltec AP851 skimming, Sequence Barracuda running the closed loop, Sequence Dart running the main return, an experimental B.R.K. Kalkstirrer, all lit with 4 - 250w 20,000K radium matal halide light fixtures and to top it all off, a JBJ auto top off unit to replace evaporated water. We also have a refugium built into the sump to grow macro algae and reduce the Phosphates and Nitrates. Yes, the water flows over the top edge of the aquarium! This 15-gallon novelty, houses a variety of livestock that changes periodically. This mini-system requires filtration as well, and we continue to use the sump style! A 10-gallon tank below holds a Euro reef skimmer and a stealth heater. An eye catching display if we do say so ourselves!